The only thing consistent about Chelsea’s performances this season is how wildly inconsistent they’ve been, sometimes within the same match. That was quite the case Wednesday night at Vicarage Road which saw Chelsea and Watford play to a 0-0 draw. A man of the match performance from Heurelho Gomes kept the visitors at bay, while Thibault Courtois made a couple key first-half saves to deny the hosts any goals. 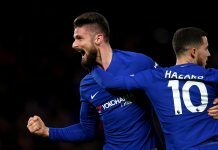 Guus Hiddink showed faith in the side that played MK Dons at the weekend, making just four changes from the weekend and bringing back what seems to be his first-choice side for the time being. Willian, John Obi Mikel, Cesar Azpilicueta, and Kurt Zouma returned, with Eden Hazard, Ruben Loftus-Cheek, Baba Rahman, and Gary Cahill making way. Chelsea settled into the match first, producing a good opening spell in possession and rarely giving the hosts a sniff of the ball. But as Watford began to grow into the game, it looked increasingly likely that a goal would eventually come. That isn’t to say that Chelsea didn’t make things interesting. The good and bad sides of Diego Costa came out within a few minutes of each other. One minute, he’s pushing Sebastian Prodl in the back, drawing a whistle after Branislav Ivanovic had released Oscar with a through ball in the penalty area. The next minute, he’s romping with the ball down the right-hand side, twisting and turning his defenders and forcing a block from Craig Cathcart. But it was Watford who created the better chances in the first half. Odion Ighalo had been making himself a nuisance all match with his pace and willingness to close down and should have put Watford 1-0 up inside 30 minutes when Jose Holebas bamboozled the Chelsea defence with a dipping cross that Ighalo could only glance straight into the ground from 6 yards out. His blushes were nearly spared two minutes later. Watford had given the Blues some trouble from set pieces from the start, and Jose Manuel Jurado picked out Prodl near the penalty spot with his delivery from the corner. However, the defender’s header was straight at Courtois. 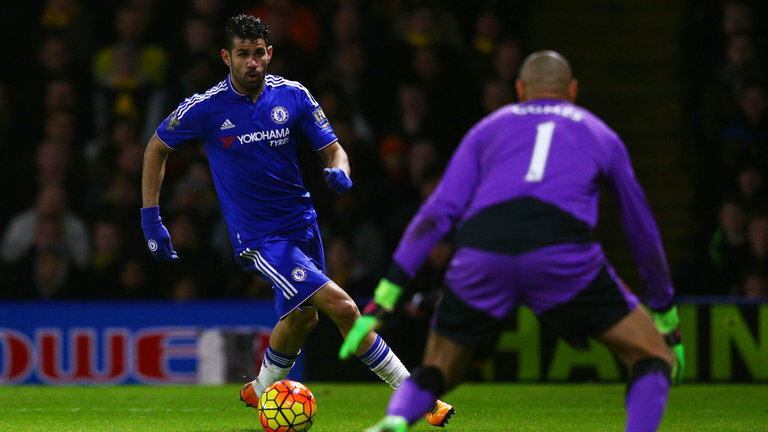 Watford continued to threaten Courtois’ goal, this time from Etienne Capoue. The former Tottenham man was freed down the right side from a great ball from Jurado, who was making himself a menace, but his powerful effort was pushed wide by Courtois. Costa nearly punished the hosts for their missed chances when he latched on to a long ball from Oscar through the left channel. But under pressure from from Prodl and Cathcart, Costa could only fire wide of the target. 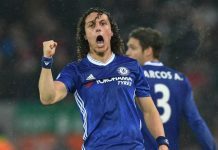 Chelsea upped the intensity a bit more in the second half, and the torrid pace with which Watford pressed Chelsea appearing to take a physical toll. Oscar had a real chance just inside the hour mark when Costa found him with a pull-back from the byline, but the Brazilian couldn’t make good contact and flicked his shot wide. The introduction of Hazard on 73 minutes livened things for the visitors, particularly as the midfield duo of Mikel and Nemanja Matic were having difficulty creating chances from deep. With Cesc Fabregas now sitting deeper and Hazard taking up position on the left, the fluency of Chelsea’s play began to appear. Hazard’s romp through the right-hand channel was found by Willian, and the Belgian’s cutback for Ivanovic forced a great reaction save from Gomes at his near post. Then just minutes later, Hazard had a brilliant chance to score when Willian again found him, this time near the edge of the area. Hazard’s touch was a bit too heavy, and it allowed Gomes a chance to smother at his feet. Chelsea’s best chance of the match came just before the end of 90 minutes. Costa rose to meet Willian’s excellent delivery from the corner, but Gomes was able to claw his point-blank header away to deny Chelsea the 3 points on the night. While neither side will be unhappy with a draw, perhaps Chelsea might be playing a game of “what if” given the showcase they put on at the weekend against MK Dons. Quite simply, the side that played such dazzling football was rarely seen against Watford, and the reality is that if you don’t create many chances, scoring goals and taking points can be a problem. Previous articleWho Will Take the Armband from Terry Next Season?